Authors have a magic all their own, and that is especially true of Menna van Praag. The Dress Shop of Dreams is an ensemble story, weaving the stories of several characters into one. Readers are introduced to characters one at a time, getting to know each as an individual before they begin to reveal their connections to one another. The common thread that runs between all of the characters is Etta, a dress shop owner who knows exactly what her customers need from a garment. Her granddaughter, Cora, was orphaned at a young age and is as closed off as Etta is open-hearted. Etta works her particular kind of magic with a spool of thread and a few quick stitches. She knows how much Walt, the quiet bookseller down the road, loves Cora-has always loved Cora-and sets in motion a string of events to lead Walt to Cora . . . and Cora to love. The Dress Shop of Dreams blends magic and mystery, weaving a story that sparkles with love. I enjoyed every scene and page. I haven’t read anything by Menna van Praag, but she has quickly joined the list of authors that captured my imagination and my reader’s heart. She reminds me of Sarah Addison Allen and Cathy Lamb -two of my favorite authors and, in this reader’s opinion, prestigious company to be in. 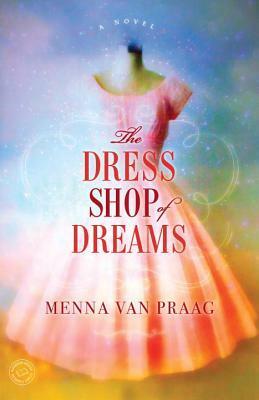 I received a free copy of The Dress Shop of Dreams on NetGalley in exchange for an honest review.